MACKAY, Charles William – 82, Liverpool, NS. It is with great sadness that we announce the peaceful passing of our husband, father and grandfather on November 25th, 2012, at home, with his wife by his side. Born in Bridgewater in 1930, he was the son of the late Ralph and Daisy (McLean) MacKay. 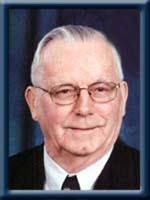 Charles worked for Chandlers’ Funeral Home for 3 years and then the NS Liquor Commission for 23 years before retirement. He was a member of the Liverpool Baptist Church since 1964 where he served as deacon, trustee, usher and was part of the cemetery committee. Charles was also a Scout Leader for many years and enjoyed his summers at the family cottage on Harmony Lake. He will be fondly remembered as a devoted husband, loving and patient father and a beloved, devoted grandfather to each of his grandchildren and has left behind great life lessons and values. He is survived by the love of his life, his wife of 53 years Enid (Hartlin). His daughter Kirsten MacKay (Sifton Mosher) of Eastern Passage; son Duane (Anne) of Milton. He will be sadly missed by his pride and joys of his life, his granddaughters Hannah & Morgan, his grandson Casey and his “adopted” grandson Matthew Blackler. Charles is also survived by many nieces and nephews. He was predeceased by his sister Helen and brothers Frank, Harold, Kenneth, Robert, Laurie and Aubrey. We were sorry to hear about Charles. Our thoughts and our prayers go out to your family. We are so very sorry for the loss of such a great Man…To you Enid and families are hearts are very sad,how wonderful it is to know that Charles is home with his Lord….You will be in our hearts and prayers…God bless you all at this sad time in your life..
Clyde and I were so sorry to hear of Charlie’s passing. Please know that you are in our thoughts and prayers at this difficult time. Take care of each other. My deepest sympathy to you and your family at this sorrow time. I know that no mere words can ease the pain that you are going through but maybe by knowing that others share in you grief that it may ease some of the pain you now feel. Sending our heartfelt sympathy to all of you as this sad time. So very sorry to hear of Charlie’s passing. I have a lot of fond memories working with him at the Liquor Commission. Our thoughts are with you Enid and your family. He was a special man. I send precious hugs to all three of you. Although, it’s been many years since we have seen each other sometimes it just seemed like yesterday we were in elementary school together, Duane and figure skating year after year with each other and hanging out on a daily basis, Kristie. I remember your dad or mom always picking up or dropping you off wherever we were. Your dad was indeed a very loving and caring person and he showed it on a daily basis. Even though I am unable to attend the service on Thursday my thoughts will be with you then and always. Take care. Sending my sincere sympathy to the family; my thoughts are with you at this sad time. Sending our heart felt sympathy to all of you at this sad time. Enid and family: Our hearts and prayers go out to you all during this difficult time. Charlie will always be remembered as a loving husband, father and grand-father. His warm and cherful smile will never be forgotten. God Bless. We were so saddened to hear of Charlie’s passing.He was a great person,and very well thought of by everyone.Please know that our thoughts and prayers are with you all at this time. Sending you all my love and deepest sympathy at this time. So sorry for your loss, Mr. MacKay always seemed to be a kind and gentle soul, condolences to you all. So sorry for your loss. Keeping you and your family in thought and prayer. Enid and family, you have our deepest sympathy, take care. Enid, I was saddened to read of your husband’s passing . How quickly time goes ! I think back to the days when you and I were in school together – those early years- and all the joys and sorrows we have been called upon to bear since then, as the years have gone by. Now is a time of great sadness for you and your family, and my thoughts are with you , Please accept my sincere condolances. Duane and Family we are sorry about your loss.Thoughts are with you and your Family at this sad time. Enid and family, We would like to express our sympathies to all of you on the loss of your loved one. Memories, Family and God’s blessings will help you through this time of sorrow. Enid and family, so sorry for your loss. Thoughts and prayers are with you at this difficult time. Enid, Krissy & Duane- So sorry and saddened to hear of your loss, our thoughts and prayers are with you at this extreamly difficult time. May you have peace in the great memories that you have. We have great ones ourselves. I am so saddened to hear of Charlies passing. He was always pleasant and smiling no matter where we met. My deepest sympathy at this difficult time. Dear Enid and Family , we are so sorry to hear of Charlie,s passing.Hang tight to all your memories as they will help to heal the loss you are feeling . we send our sincere sympathy and will keep you all in our thoughts and prayers. We are so sorry for your loss. Our prayers and thoughts are with you all at this sad time. We were so sorry to hear of Charlie’s passing. We have many fond memories of our walks in Pine Grove park when you and Charlie had Brutus and we had Faline and Rudy. Our thoughts and prayers are with you! Enid,,,,,, I was sorrow to read of Charlies passing. Please accept my Deepest Condolences. I have many fond memories of our younger years in Harmony Mills. My thoughts and prayers are with you, at this very sad time..
Sincere sympathy in the loss of your dear husband, father and grandfather. May God`s presence be very real to you at this sad time. Sending our sympathy and keeping you in our prayers at this sad time. God Bless You all. Please accept our condolences on the passing of Charlie. Our thoughts and prayers are with you at this most difficult time. So sorry for your loss…thinking about all of you at this time! Sorry to hear about Charlie!He was a good man!Holod him always in your hearts! So sorry to hear about Charlie, my thoughts are with you. I am so sorry to hear of your loss. My deepest sympathy to you and your children at this very sad time. We were so sorry to hear of your Dad’s passing, Duane.Keep all of your memories of him close to you when you are missing him.It really does help.You are in our thoughts. I was deeply saddened to hear of your loss.Some of my fondest childhood memories include Charles and your entire family..whether it was vacations.going to the cabin or getting in trouble for being to loud when we had sleepovers I will always smile when I think of those memories..I will always have a special place in my heart for Charles and all three of you..with all my heart I send you my deepest condolences. Bobby and I were so sorry to hear of Charlie’s passing. He was so good with Bobby when he was a Boy Scout under his leadership. There are many young men who grew through his gentle hand and genuine desire to guide them. He will be sadly missed. Our sincere condolences. Very sorry for your loss. I remember mr mackay growing up on barss st.all the best to all of you.